In the preparation stage of a bridge replacement located in Boise Idaho, the Idaho Transportation Department (ITD) commissioned a geophysical survey to address uncertainties in the soil profile across the river. Differing site conditions can impact the final design and cost of a project. To address the geologic uncertainties under the planned bridge replacement, the refraction method was selected. Selection of a geophysical method bears its own risk. Refractions are used to map the top of the competent geologic formation below those soils incapable of supporting the structure. The refraction method requires that P-wave velocity increase at the boundary to be mapped. That requirement was not met in this project. Unexpected pore pressures in the formation to be mapped reduced the P-wave velocity by 30%, causing the plan to fail. 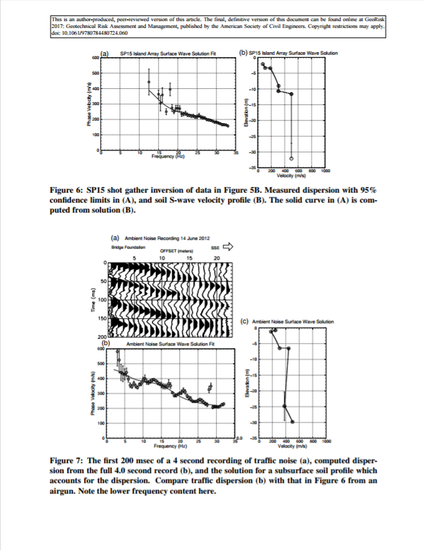 Fortunately, surface wave analysis provided an viable alternative to work with the data, but with less depth of penetration due to the lack of low frequency content in the air gun source.